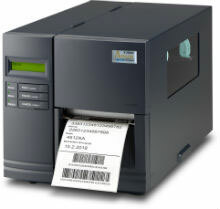 The Argox X-2000V (competitive emulations E & D) and Argox X-2000V Zip (competitive emulation Z) 4" thermal transfer printers have an all-metal housing for heavy-duty printing. These printers can print up to 6 ips, and the adjustable dual-sensor system accommodates a variety of media. Changing settings, managing print jobs, and recovering from errors is simple using the LCD display and operation panel.